For me, Broken Horses is a strange, ill-fitting mixture of a distinctive cinematic sensibility and a precisely defined time and place in which the film is supposed to be set. The film�s director, Vidhu Vinod Chopra, started working on films over 40 years ago, but in this piece, he only manages to end up as a person who is coming from a completely different place of creative thinking, and gets lost in a strange land of different cultural values and approaches to telling tales. Broken Horses is a story of two brothers who get separated in a small southern US town when their father and the local sheriff, gets murdered. One brother goes away and becomes a successful musician, while the older one remains, falling under the influence of a local crime boss. Many years later, the younger brother returns, but he is not wanted in the dust bowl of his old hometown. 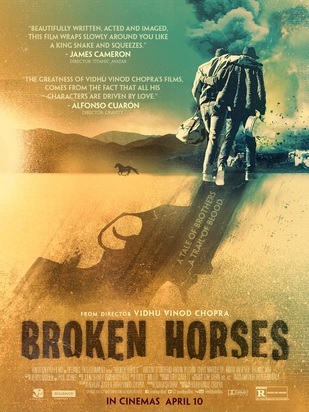 With a cast of great actors, primarily Vincent D'Onofrio, Anton Yelchin and even Chris Marquette (even though he took his role way over the top), Vidhu Vinod Chopra takes Broken Horses to art-house territory and back into cartel-thrillers in a matter of minutes. These constant transitions are nauseating, even though they take place in really impressive, almost theatre-like sets and feature some fine cinematography in the style of the modern western/neo-noir films. A lot of this is the work of Tom Stern, a director of photography well-known in the AAA realm of Hollywood. In Broken Horses, it is the main director who doesn�t know how to approach this story of the two brothers, apart from its beginning and its end. Like many films with a lot of style and inadequate amounts of substance, it is the middle segment where the Broken Horses fail to be an impressive work of art, but also to entertain in any way.